Home Editorials What Would An Eruption Of The Yellowstone Supervolcano Look Like? On Sunday, the worst earthquake in about 30 years rattled the Yellowstone supervolcano. Overall, there have been at least 25 significant earthquakes at Yellowstone National Park since Thursday, but it is the 4.8 earthquake that has many observers extremely worried. Could such a large earthquake be a sign that the Yellowstone supervolcano is starting to roar to life after all this time? And if it does erupt, what would that mean for the rest of the country? As you will see below, a full-blown eruption at Yellowstone would be absolutely catastrophic. It is estimated that such an eruption could dump a 10 foot deep layer of volcanic ash up to 1,000 miles away and render much of the nation uninhabitable for years to come. In essence, it would instantly bring the United States to its knees. That video was captured during the month of March well before the 4.8 earthquake happened. Could it be possible that those bison sensed that something was coming? The danger posed by Yellowstone should not be underestimated. Late last year a new study into the enormous super volcano found the underground magma chamber to be 2.5 times larger than previously thought – a cavern spanning some 90km by 30km and capable of holding 300 billion cubic kilometres of molten rock. If the sleeping giant were to wake, the outflow of lava, ash and smoke would devastate the United States and affect the entire world. 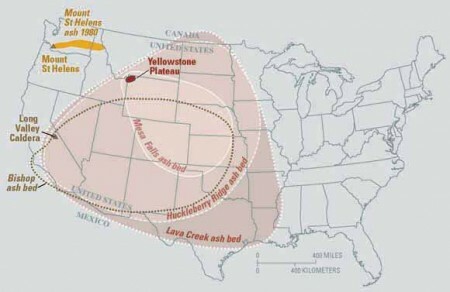 In essence, a Yellowstone eruption would be on the same level as a Carrington event. Either one would fundamentally change life in the United States in a single day. Personally, I certainly hope that we do not see an eruption at Yellowstone any time soon. And actually, I am much more concerned about the possibility of an eruption at other volcanoes in the northwest such as Mt. Hood and Mt. Rainier. But if the ground keeps rising rapidly at Yellowstone and earthquakes like the one that struck on Sunday keep on happening, then it would be very foolish for us to ignore the warning signs. And of course you shouldn’t expect the government to warn you about the potential threat of a Yellowstone eruption until the very last moment. Generally speaking, the government is much more concerned about “keeping people calm” than it is about telling us the truth. We seem to have moved into a time of increased seismic activity all over North and South America. In such an environment, it would not be wise to say that an eruption at Yellowstone “can’t happen”. The truth is that an eruption at Yellowstone could happen at any moment. Let us just hope that we are all out of the way when it does.